I've always been a bit skeptical about a store's home brand. Despite being a major OPI lover 4eva, I was never a fan of the Sephora by OPI nail polish line sold at Sephora stores everywhere. They had an immense colour selection and lovely little bottles, I even got one for christmas once and was fairly happy with it! For some reason or another though, they just simply never clicked with me. So, when Sephora announced the launch of their all new nail polish and nail care line - Formula X - I was intrigued! Preliminary reviews were raving about them and the line-up was full of finishes and hues that I could drool over. Ok, ok, enough backstory! 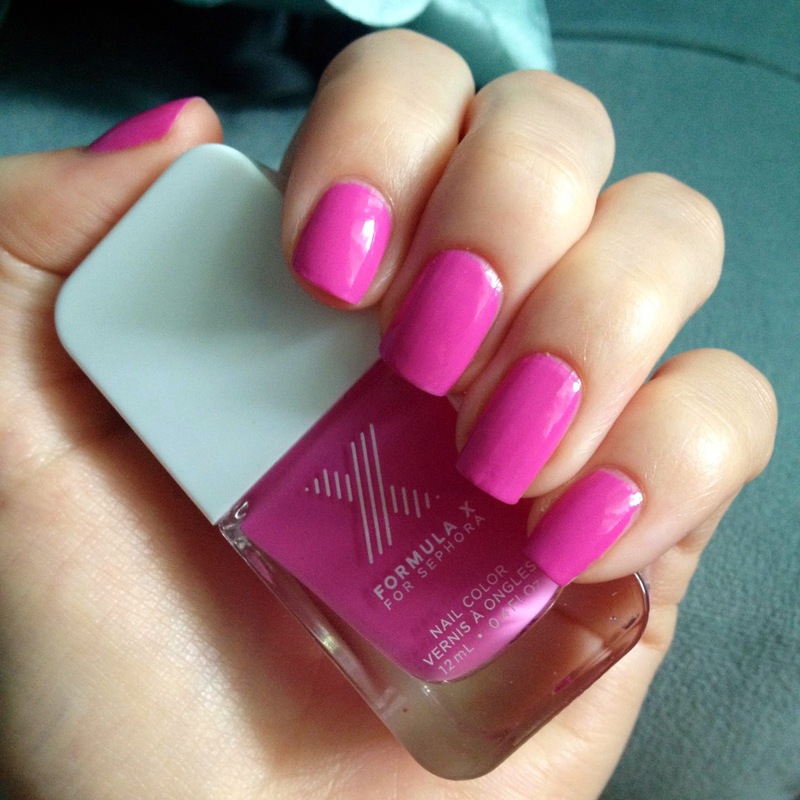 I was on a hunt for the right "Radiant Orchid" nail polish shade and grabbed a pretty little bottle of Formula X - Gemini. The shade didn't turn out to be quite the colour I was looking for, but it's pretty nonetheless! It's a bright pink with strong purple undertones that reminds me of flower petals. It's fairly similar to OPI - If You Moust You Moust that I showed in a previous post but Gemini leans much more purple/orchid. Despite the pretty colour, the most beautiful aspect of this polish is the formula. Oh god, I could write you an epic love poem about this formula. One-coat wonder. High shine. Quick drying. Long-lasting. Streak-free. Scratch that, I'm too dumbfounded to give you a full sentence about how amazing this nail polish is. Yep, it's amazing. That's all you're getting. I will definitely check out more of these shades because it literally gives me pleasure to paint them on. If you can, grab one in any colour you like and experience it for yourself!